Twitter has always been a little more... unregulated than other social networks, but it's gotten a bit more toxic in the last year or two. The company has today announced some tools that could make it more tolerable. Twitter will proactively tackle abusive behavior even when it's not reported, and the app will gain some new tools to make it easier to sweep unpleasant tweets under the virtual rug. The Twitter app will soon gain much more robust notification options. These advanced filters support ignoring pings from accounts without an avatar, phone number, or verified email. That should cut down on spam. 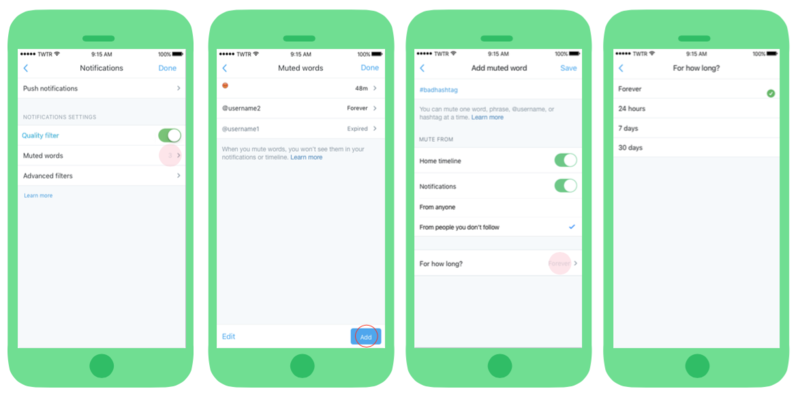 Muting will be more powerful as well with the ability to block Tweets that include certain words or phrases for as long as you want. You can also choose to only mute those tweets from people you don't follow. When you report content on Twitter for harassment, the app will now be aware of those reports. The notification tab will alert you when reports have been received, as well as when (or if) action is taken based on your report. Twitter will also leverage its algorithms to proactively take action against abusive accounts in the absence of a report. For example, an account that is tweeting aggressive things at multiple non-followers. Twitter may temporarily mute that person. All these changes are rolling out to the Twitter app in the coming days and weeks. Feature updates like this are usually handled by a server-side change, so an app update probably isn't necessary.